All the remaining Bath & Body Works' shower gels in my body wash drawer are all first-time fragrances. 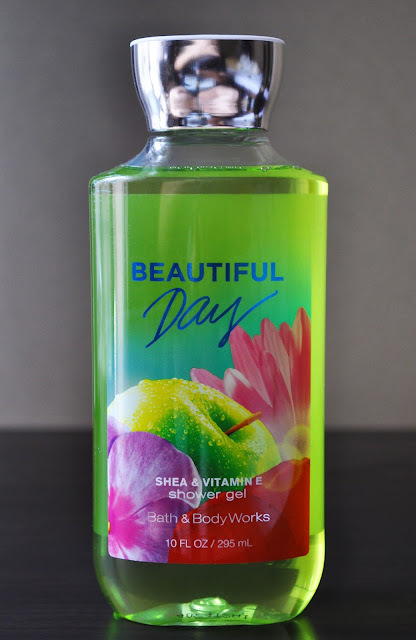 So, as I was sniffing for August's body wash, Beautiful Day's perfectly balanced, crisp, fruity-floral scent felt most fitting for the rising temperatures. Top Notes: Sun-kissed Apple, Dewy Pear, Sparkling Cassis. Mid Notes: Wild Daisies, Lily of the Valley, Fresh Pink Peony. Dry Notes: White Peach, Blonde Woods. Beautiful Day smells just like a green apple jolly rancher, with hint of pear and a soft floral twist. The juicy apple note is the most prominent scent in the body wash, and I find it's fresh, clean fragrance reinvigorating. Also, Beautiful Day lathers up exceptionally well, and feels great. After showing, my skin feels soft and the "perfect for Summer" scent lasts for a long time. Have you tried any products from the Beautiful Day collection?